The Virgin as the Woman of the Apocalypse; Peter Paul RUBENS; c. 1623-24; oil on panel; J. Paul Getty Museum, Los Angeles. In the centre, a woman and her child: she protects him from a dragon with several heads that is crushed by a man. 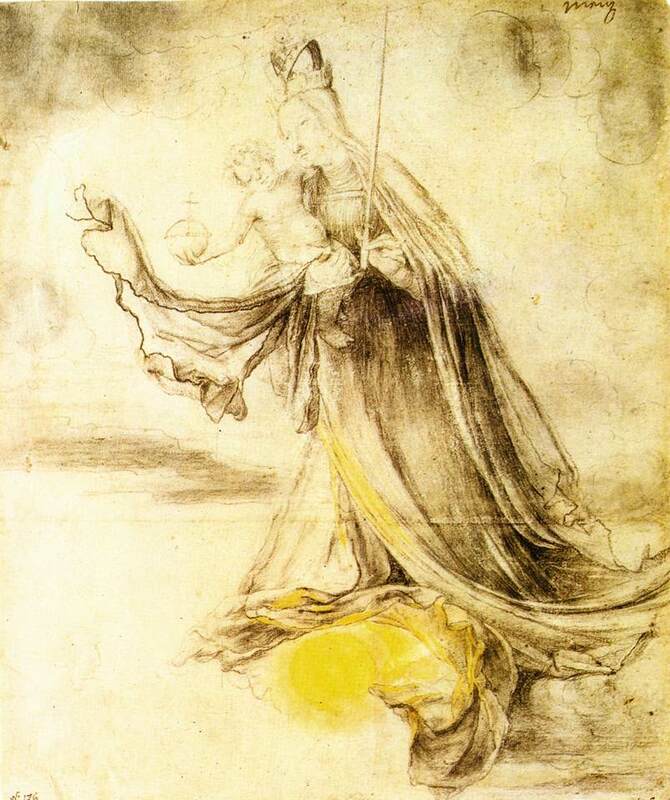 On the right, two angels and at the top, God the Father points at the child. This is the woman of the Apocalypse who gives birth to a child, the dragon wants to devour. A woman is standing whose feet are placed on a big moon crescent and whose head wears a crown of 12 stars. “Clothed in the sun”, she radiates either because of the rays coming from her body or because she is in a precious metal that glitters. If this woman is pregnant, she is definitely the woman of Revelation. If she carries a child in her arms and if a big red dragon with seven heads and ten horns attempts at seizing it, she is still the Woman of Revelation. If the woman is neither pregnant nor with a child, we are possibly in the presence of a glorification of Mary, either the Immaculate Conception or the Assumption. Mary, being identified with this figure of Revelation, becomes the Virgin Mother, Queen of the Heaven, and one can then simply add the sun, stars and moon to a traditional Virgin Mary with the Infant Jesus. The moon is often reduced to a crescent, like that of Diana, and from the 16th century on, she has not been without evoking the Turkish crescent dominated by Christianity. means that she was conceived by her parents but that she was born without what is called the Original Sin, that of Adam and Eve, transmitted to all men and women. She becomes a new Eve who crushes the head of the serpent with her foot. At her death, Mary did not experience the common ending of humans; she inaugurated the resurrection that all men will know at the end of times; she entered body and soul into God’s world. 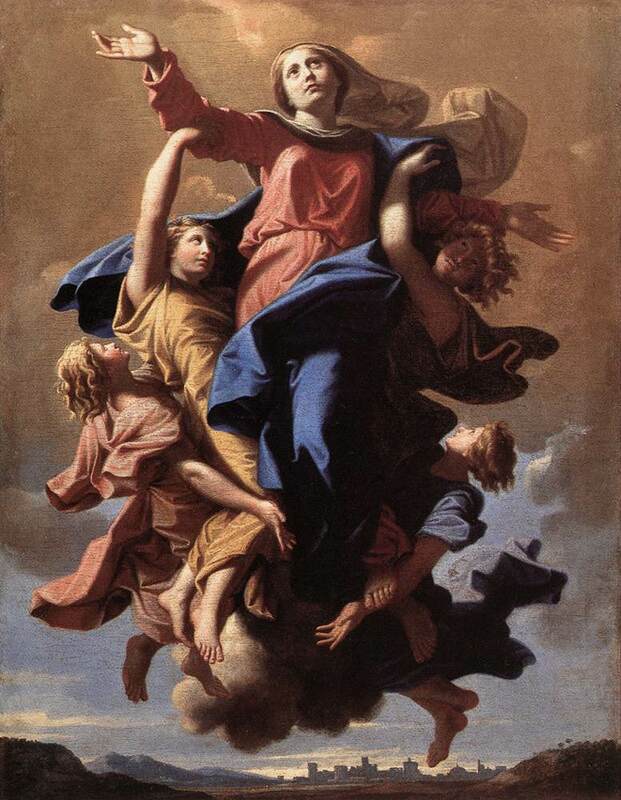 This “carrying away to Heaven” bears the name of Assumption to distinguish it from the ‘rise’, the Ascension of Jesus. Normally, she should be carried away by angels whereas Jesus rises by himself, even if he is accompanied by angels. Actually the Assumption is often represented as an Ascension. that is not easy. 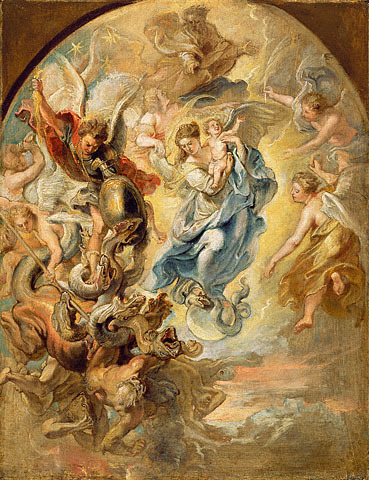 One can say the Immaculate Virgin descends, her eyes are looking down whereas the Virgin of the Assumption rises and looks up at the heaven where she is often welcome by the Trinity. In any case, this is always the triumph of Mary. And there appeared a great wonder in heaven; a woman clothed with the sun, and the moon under her feet, and on her head a crown of twelve stars: And being with child she cried, travailing in birth, and pained to be delivered. And there appeared another wonder in heaven; and behold a great red dragon, having seven heads and ten horns, and seven crowns on his heads. And his tail drew the third part of the stars of heaven, and cast them to the earth: and the dragon stood before the woman who was ready to be delivered, to devour her child as soon as it was born. This text is placed within the context of the end of time and of the Last Judgment. The woman adorned in the sky and pregnant evokes the birth of a new world. The child who is born is the Messiah threatened by the dragon. This is Satan, the one who took the shape of the serpent in the earthly Paradise. He will be killed by Michael and his angels. The Woman of Revelation can be understood as the image of May giving birth to Jesus, as that of the messianic community engendering Christ and the believers. The former interpretation is that behind the iconography of this vision. A text difficult to represent; Baldung passes through the intermediary of the seer who is John, the author of the Book of Revelation. 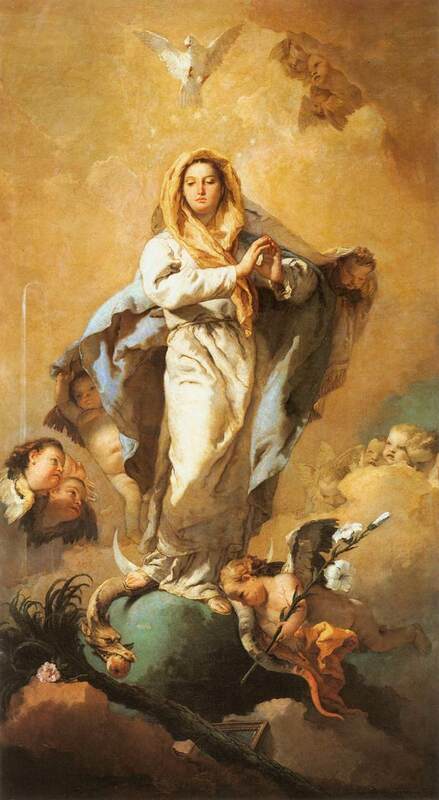 Three centuries later, one can find the same elements: sun, moon, and serpent but the pregnant woman becomes the Immaculate, born and given birth without sin. A pregnant Woman clothed with the Sun and standing on the Moon; c. 1450; coloured pen drawing; from the “Speculum humanae salvationis”; manuscript MMW 64 G4 11; Koninklijke Bibliotheek, The Hague. 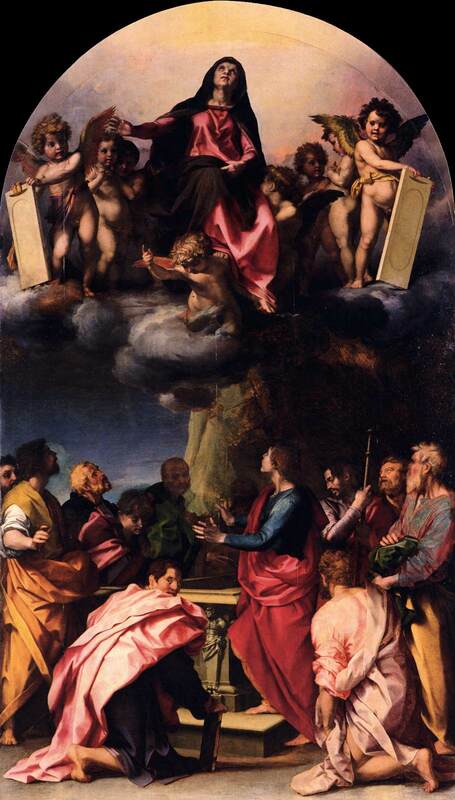 The Assumption remains linked to the death of the Virgin, then it becomes a simple ascent to Heaven. 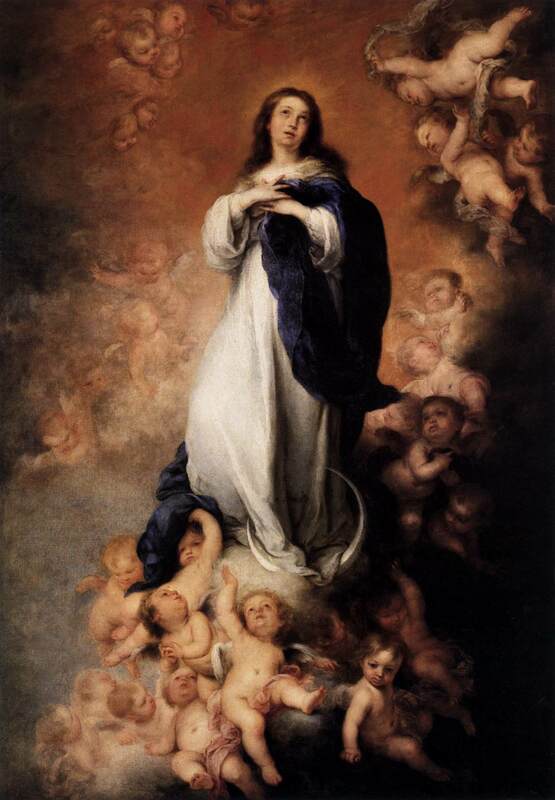 Murillo is a specialist of Mary’s pictures but the differences between the Assumption and the Immaculate Conception are hardly perceptible. In the Assumption, the Virgin ascends to Heaven; in the Immaculate Conception she descends towards the earth but her eyes are still fixed on Heaven. The Assumption of the Virgin; Bartolomeo MURILLO; c.1670; oil on canvas; the Hermitage Museum, St Petersburg. on August 15th is, in Catholic regions, a great popular celebration that is the opportunity for processions in honour of the Virgin Mary. This very ancient feast dating back to the beginning of the 7th century celebrates the death or "dormition” of Mary and her resurrection following that of Jesus for Catholics believe that if Jesus is alive in the glory of his Father, Mary, who is one flesh with him, must participate to it. A pardon in Brittany on August 15th. forming a crown have become the symbols of European unity. Some see in it the direct influence of the Woman of Revelation, for the founders of the united Europe were, like the Frenchman Robert Schuman, the German Konrad Adenauer, or the Italian De Gasperi, Christian democrats of Catholic denomination. In any case, the stars do not correspond to the number of states as in the American flag; they are still twelve, a sign of plenitude referring to the 12 signs in the zodiac that fill the time and the sky whose colour is blue.